Tag Archive | "currency loans"
Here is an update on the Swiss MultiCurrency Sandwich. Currencies are being devalued around the world. This means we have to work harder to maintain purchasing power of our wealth . The MultiCurrency Sandwich is one way to enhance earnings. I am updating my report Borrow Low – Deposit High and noticed in my research that the Swiss Franc now looks overvalued… and its loan rate is very low. Last March 18 a message at this site suggested to borrow Swiss francs and Japanese yen to invest in currencies with higher yields. Since then both the yen and Swiss franc have weakened which has locked in some forex profits. 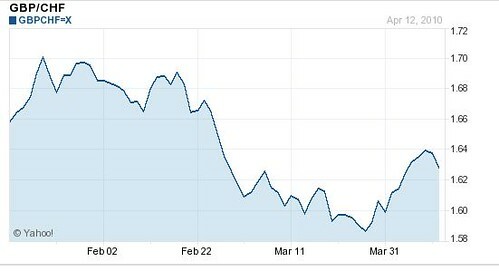 Here you can see how the yen peaked in late February and has dropped versus the euro. Here we’ll review the Swiss Franc opportunity as the Swiss franc has strengthened but may be taking a turn as it recently dropped back from 1.43 francs per euro to 1.44. #2: The strong currency has weak fundamentals. #3: This strong currency has risen so high it is overvalued. #4: This strong currency has a very low interest rate. #5: Another currency that has fallen so much (versus the strong currency) that it is undervalued. #6: This weak currency has strong fundamentals. #7: This weak currency has a high interest rate. The Swiss franc has appreciated versus the euro significantly in the last year. 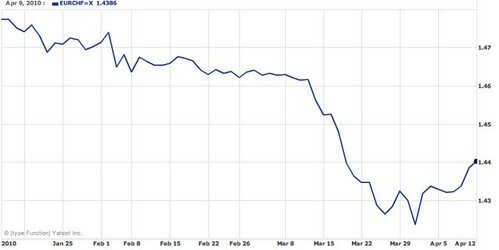 You can see the franc’s surge against the euro in this chart (all charts here are from www.finance.yahoo.com). This creates opportunity for a linked currency situation or a more speculative investment in emerging bonds.. Here is an excerpt from the Borrow Low update to show a linked currency MulitCurrency Sandwich. For example as this report is being updated you can borrow Swiss francs at an interest rate of between 2.375% and 1.625% (depending on the amount borrowed). You can invest in AAA British Treasury bonds that pay in the 4% range. The dollar at this update (April 2010) is worth 1.06 Swiss francs and the British pound 1.64 Swiss francs. Assume for this example that you have $100,000 invested in a US dollar Treasury Bond paying you 4%. This $100,0000 bring in $4,000 a year income. You can use that bond as collateral to make a SFR424,000 Swiss Franc loan at 2.375% range. The Swiss Franc loan could have then been converted to £258,536, which could be invested in the AAA rated 4.5 % British TREASURY 07-03-2019 bond that was yielding appx 3.9% in April 2010. You earn GPB10,082 per annum interest which is worth SFR16,534 less loan interest of SFR10,070 which means you enhance your income by just over $6,000 a year. In other words, your $100,000 now earns $10,000 a year rather than $4,000. .. a 150% increase in income. The tactic is not quite this simple. We’ll look at the complexities in a moment, but this is the idea. The entire instruction to make the loan in Swiss francs, convert the francs to pounds and invest the pounds could have been given in one simple letter, fax, phone call or email. This example showed how to invest in a very safe bond in linked currencies . The pound is linked to the euro and the euro is linked to the Swiss franc. Later we’ll see how because the pound was weak in April 2010 and the Swiss franc at an almost all time high… there was some interesting forex potential also. Many currencies are linked either by government choice or through tradition and regional economic circumstances. Take the Swiss franc British pound link as an example. The pound is linked to the euro and the Swiss franc is linked to the euro by economic necessity. 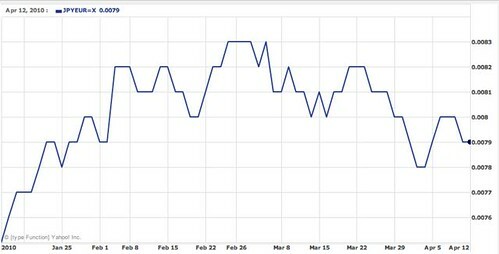 Here you can see how the Swiss franc strengthened versus the pound until the end of March. Many investors make the mistake of thinking that the Swiss franc can be a super strong currency. I have warned about this error for well over a decade. However, the mistakes of other investors can make opportunity for you. Years ago in a different world, Switzerland was isolated and fiercely independent. Its mountainous terrain and well organized citizen’s army gave them the strength to claim and enforce neutrality. The small population (about 6 million) believed in personal privacy and hence banking privacy. The people were incredibly conservative and highly efficient. They did not believe in government debt and demanded that their national bank keep a large amount of gold as a reserve for their currency. This made Switzerland an ideal banking center in those days plus made Switzerland a refuge in times of turmoil. Swiss francs in a Swiss bank account were one of the ultimate forms of financial safety at that time. This all changed. The computer, new tactics in war and the global economic community turned everything upside down. The computer was like the Colt .45, a great equalizer, making bankers in England, Italy or Spain etc. as efficient as the Swiss. New instruments of war, intercontinental and cruise missiles, nuclear weapons, etc. dramatically reduced Switzerland’s natural defenses. had to open centers abroad and hence became vulnerable to other countries’ laws. They lost some of their independence! Today Swiss banks are affected by what happens in the US and other countries (they have a huge investments globally. More importantly the Swiss franc is no longer the reserve currency of last resort. Switzerland is a tiny country poor in terms of natural resources lacking oil, minerals and the ability to feed itself. Switzerland’s wealth is in its industrious, precise people. It is a trading nation and must maintain a currency at parity with the nations where it exports goods. Switzerland must export to survive. Half of its exports go to Germany. When the Swiss franc becomes too strong, especially against the euro, the Swiss must act to force its parity down. The last time the Swiss franc was too strong, the Swiss imposed a 12% per quarter negative tax on Swiss franc accounts held by overseas investors. Switzerland is a good banking center, yes. The Swiss franc is a strong, stable currency, yes. Yet the Swiss cannot afford to let the franc rise too high. I have shared this information for at least fifteen years warning not to invest too much in Swiss francs when it is strong. 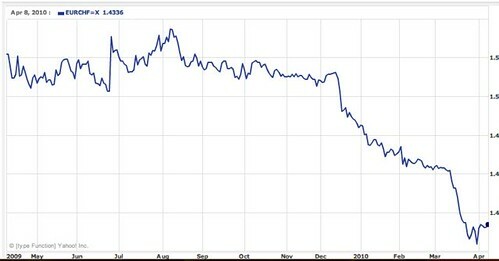 In fact you should borrow Swiss francs and invest in euros and other related currencies, as shown above, when Swiss franc interest rates are down (as they are now). This creates a double distortion that creates two opportunities. You gain the positive carry on euro rates over the Swiss franc loans. You also gain an extra chance for a foreign exchange profit. Currencies globally are losing their purchasing power. To maintain the value of our wealth we need to do more than just save. The multi currency sandwich is one way to enhance the earnings of your capital. I am updating Borrow Low-Deposit High now. When the new update is complete, it will be offered at $79. This report will include ideas on were to invest in China and Russia with Japanese yen or Swiss franc loans (or both) now. You do not have to wait and miss this yen opportunity, buy our report “Borrow Low-Deposit High” for $49. I will email it to you immediately… plus when the new update is complete, I’ll email that to you also… FREE. The report helps you see why and where to invest and learn why and how currencies and interest rates rise and or fall. Finally, as always you are protected by our 30 day completely satisfied or your money back guarantee. Borrow Low Deposit High – How to Use the Multi Currency Investment Sandwich… click here to get this emailed report for only $49. This is also why we maintain close contact with Jyske Bank, Denmark’s second largest bank. Denmark is rated by Standard & Poor’s as the safest country in the world to bank in. Jyske Bank is the only bank we know that specializes in the Borrow Low-Deposit High strategy. Jyske Bank is also one of the leading currency traders in the world. Unlike most banks (that trade only eight hours a day) Jyske maintains a 24 hour trading service. They have been our bank for over twenty years and help us stay informed about global equity markets, plus global currency parity and interest rate trends so we can learn from portfolios that are real time. What you learn from is actually happening as our service unfolds. More importantly, Jyske Bank has created an entire subsidiary that provides a stable and safe institution for US investors who wish to invest globally including a Borrow Low-Deposit High strategy. Save $100 more. There is another important benefit you gain when you order my emailed report “Borrow Low-Deposit High”. You can save $100 at the next Jyske seminar where I review the new H.I.R.E. overseas banking regulations. Share strategies with me in California and Save. I speak at the Jyske Global Asset Management’s April 30 – May 2 Foreign Exchange Investment Seminar in Laguna Beach, California. The normal seminar fee is$499 or $750 for two. However Jyske is providing the same discount to our premium subscribers (including those who order Borrow Low – Deposit High) as to their clients… $399 single and $599 for a couple. You save $100…even though the emailed report “Borrow Low Deposit High” is only $49. Order “Borrow Low-Deposit High – How to Use the Multi Currency Investment Sandwich”… click here to get this emailed report for only $49. Save $100 on JGAM’s California seminar. See more on the JGAM California seminar here. 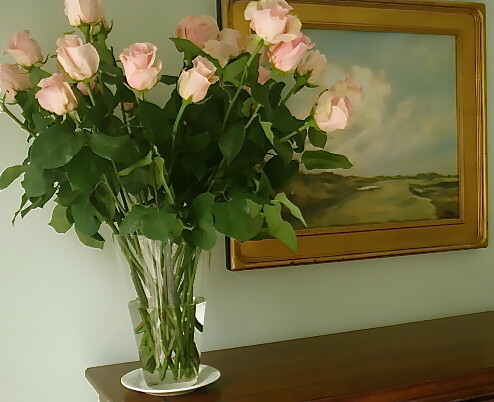 Learn more about the IRS and Mother’s Day roses in Ecuador. See an idea on Ecuador retirement here. Our Ecuador exports tour is filled but you can still learn about Ecuador real estate. 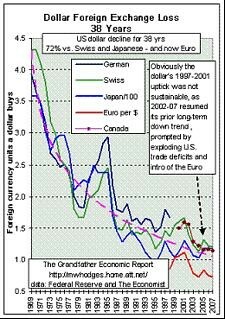 The chart above from grandfather.com shows how the US dollar has fallen steadily over the past 40 years. Yet recent posts at this site have looked at borrowing Japanese yen and investing in Euro. Why not borrow US dollars instead of yen? We must always proceed with caution when we borrow low & deposit high. The chart above shows how the dollar has had a steady downwards trend for 40 years. However note the six year spike in 1980. Anyone who borrowed the US dollar in 1980 was clobbered or had a long wait before it fell. A lot of the thinking behind the idea of the falling dollar is based around the huge US government debt and deficits along with the ever growing trade and current account deficits in the US. However Japan has even more debt as a per cent of GDP than the US… though it is mainly internally financed. Yet we need to look beyond these negatives before we speculate. There are positive forces for the greenback as well. Ignoring them is an error. These positives in the US are one reason why it may be better to borrow yen instead of the US dollar. There are five fundamental beliefs that should always part of our economic thinking. #1: Markets are efficient and always reflect fundamental forces in the long run. #2: Human emotions are not efficient and create short term distortions in markets. #3: There are always things we cannot see. #5: Belief in fundamental ideas are vital. There are always things we do not know… but fundamental beliefs have enormous power at incredibly deep levels of investing. Belief in fundamentals help us ride through short term market fluctuations created by human emotion. These facts always keep me looking for new ideas in which to believe. Having ideas that upgrade human productivity is one type of idea I actively seek. I believe that increased productivity brings greater abundance. One way I look for improved productivity is to continually monitor innovation. 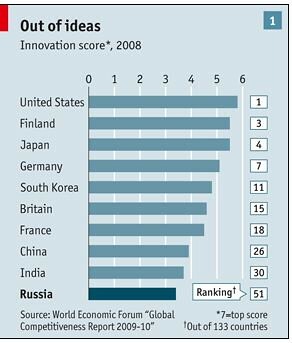 A recent story in the Economist about Russia included this chart showing innovation. The US was still in the lead. Chart from Economist article Modernising Russia – Another great leap forward? Here are excepts from The Global Competitiveness Report 2009-2010 by this forum. Switzerland tops the overall ranking in The Global Competitiveness Report 2009-2010. The United States falls one place to second position, with weakening in its financial markets and macroeconomic stability. Singapore, Sweden and Denmark round out the top five. European economies continue to prevail in the top 10 with Finland, Germany and the Netherlands following suit. The United Kingdom, while remaining very competitive, has continued its fall from last year, moving down one more place this year to 13th, mainly attributable to continuing weakening of its financial markets. The rankings are calculated from both publicly available data and the Executive Opinion Survey, a comprehensive annual survey conducted by the World Economic Forum together with its network of Partner Institutes (leading research institutes and business organizations) in the countries covered by the Report. This 38-year think tank has headquarters in Geneva, Switzerland and is an independent, international organization incorporated as a Swiss not-for-profit foundation. They strive towards a world-class corporate governance system where values are as important a basis as rules. Their motto is ‘entrepreneurship in the global public interest’. They believe that economic progress without social development is not sustainable, while social development without economic progress is not feasible. Their members represent the 1,000 leading companies and 200 smaller businesses – many from the developing world – that play a potent role in their industry or region. Since 1971 they have had an annual meeting in the village of Davos, Switzerland. So we cannot totally write off the US dollar because of the American spirit of innovation. Though it is hard to sometimes see how America can deal with its debt and deficits… imagine how much wealth another innovation, like the internet can mean to the greenback, if it comes from American innovation. This is another reason why when we borrow low-deposit high, we always look first and foremost at the positive carry… the difference between the loan rate and what we earn. Right now you can borrow Japanese yen (from Jyske Bank) at 2.5 to 1.75% (depending on how you borrow). Interest rates on the US dollar are higher… 2.75% down to to 2%. Finally we like the idea of borrowing yen right now because it has been so strong recently… without fundamental cause. This contrarian view has made sense. The yen has fallen about 5% versus the euro in the last month. The borrow low -deposit high tactic can increase earnings and profit… yet if you use a multicurrency sandwich be sure to think about the five rules above and the gold rule of all investing… never speculate with more than you can afford or willing to lose. The yen loan position looks so strong to me now that I am updating my report “Borrow Low – Deposit High”. Our emailed Borrow Low-Deposit High report can help you learn how to expand your profits with up to 400% loans just as our reports have helped thousands of readers do over the past twenty years. Tens of thousands of readers have purchased this report, and several updates, since it was first published in the 1980s. You however can have the most up to date edition at a $30 savings. I am updating Borrow Low-Deposit High now. When the new update is complete it will be offered at $79. This report will include ideas on were to invest in China and Russia (both neighbors of Japan) now. This is also why we maintain close contact with Jyske Bank, Denmark’s second largest bank. Denmark is rated by Standard & Poor’s as the safest country in the world to bank in. Jyske Bank is the only bank we know that specializes in the Borrow Low Deposit High strategy. Jyske Bank is also one of the leading currency traders in the world. Unlike most banks (that trade only eight hours a day) Jyske maintains a 24 hour trading service. They have been our bank for over twenty years and help us stay informed about global equity markets, plus global currency parity and interest rate trends so we can learn from portfolios that are real time. What you learn from is actually happening as our service unfolds. More importantly Jyske Bank has created an entire subsidiary that provides a stable and safe institution for US investors who wish to invest globally including a Borrow Low-Deposit High strategy. See how to own the view above with these sunsets. 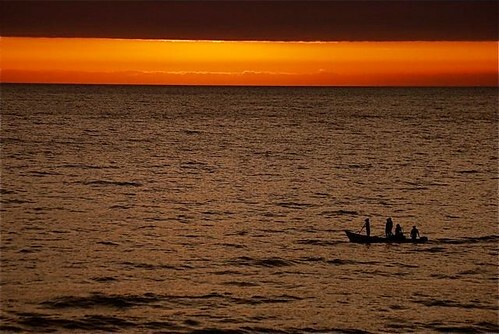 See how one person can earn $540,000 or more on an Ecuador beach view investment now.